Dharma Rain (38'54") begins in a burst of energy. The bubbling layers of sequencer notes and e-percussion leap out of the speakers as the listener experiences a tightening, a verging, a sensation of ascent from gravity's pull. Recording as Chronotope Project multi-instrumentalist Jeffrey Ericson Allen establishes a continuous musical flux in perfect proportions. Transporting the mind of the beholder to a higher level of integration feelings are breathed into this metrical opening through hollow harmonies, ringing accents and ghostly timed melodies. As if powered by motors to create relaxed, hypnotic mind motions this track reverberates in an Eastern glow. The middle third of Dharma Rain opens briefly with clouds of amorphous drones. The atmosphere soon brightens as slow-paced modulating tone patterns and accompanying lush chords emerge. With each key progression we may feel the direction of the piece change, from dark to light, from bright to portentous, from gloom to hope - all in the span of just several minutes. The concluding title track encompasses the great spirit of openness, energy and exploration the music of Chronotope Project is driven by. In this carefully ordered experience we feel pulled along on a lovely current of dancing notes and tinkling effects - the signature languid lead line lulling us in calm kindness. Producing a warming energy Jeffrey Ericson Allen will surely engage listeners beyond Spacemusic's monastic inner circle. 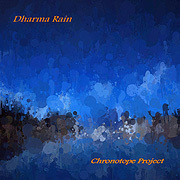 However more minimal, with its evocative, rich and dark soundspace, synthetic mechanical pulsations and quietly commanding leads Dharma Rain will make most mainstream albums of New Age music seem secondary.